The National Civic Art Society is spearheading an effort in New York City to rebuild the original Pennsylvania Station designed by McKim, Mead & White. Completed in 1910 and demolished in 1963, the station was one of the greatest buildings in American history. The depot's vast, travertine-clad main hall was cherished for the breathtaking scale of its Corinthian columns, semicircular Roman windows, and vaulted coffered ceiling. The hall’s majesty made for a striking contrast with the modern train concourse, whose glass vaults were intricately framed by steel arches. The original Penn Station was both a triumphant gateway into the city, and a shared democratic space. The station’s demolition is widely regarded as the greatest single catastrophe in American architectural history. That wrong is all the worse given the current station, which is a cramped, dismal, and dehumanizing warren. We aim to right that wrong by restoring the station to its former glory. For more information on the project, which was profiled in the Wall Street Journal, see the dedicated website rebuildpennstation.org. Video of “The Future of Penn Station” discussion co-hosted by Agora and Rebuild Penn Station: a project of the National Civic Art Society. In partnership with Rebuild Penn Station: a project of the National Civic Art Society, Agora presented "The Future of Penn Station," an evening addressing various proposals to fix the deplorable station. The event took place on October 24, 2018 at the W83 Ministry Center in New York City. The speakers were Kevin Baker of Harper’s magazine, Dani Simons of the Regional Plan Association, Richard Cameron of Atelier & Co., and Samuel Turvey of Rebuild Penn Station. Justin Shubow of the National Civic Art Society moderated the panel. In this October 10, 2016 lecture sponsored by the National Civic Art Society, Calder Loth, Senior Architectural Historian for the Virginia Department of Historic Resources, provided the arguments for rebuilding destroyed historic landmarks, and offered examples from around the world. "The New Penn Station: Everything You Should Know." Architectural Digest. "Penn Station's Glory Days Inspire Plan for Its Future." Wall Street Journal. "The Answer to Penn Station Problems Is to Rebuild the Original, Architects Say." NJ.com. 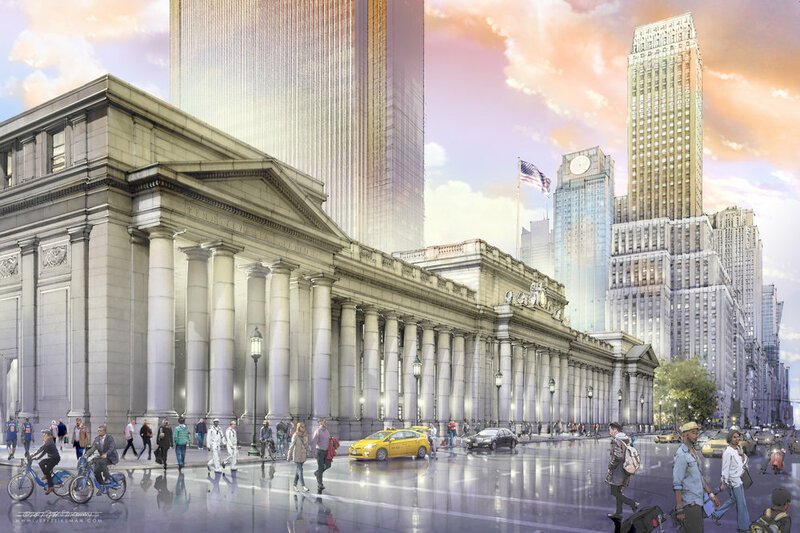 "A Dramatic Plan To Rebuild Penn Station & Restore Its Lost Grandeur." Gothamist. 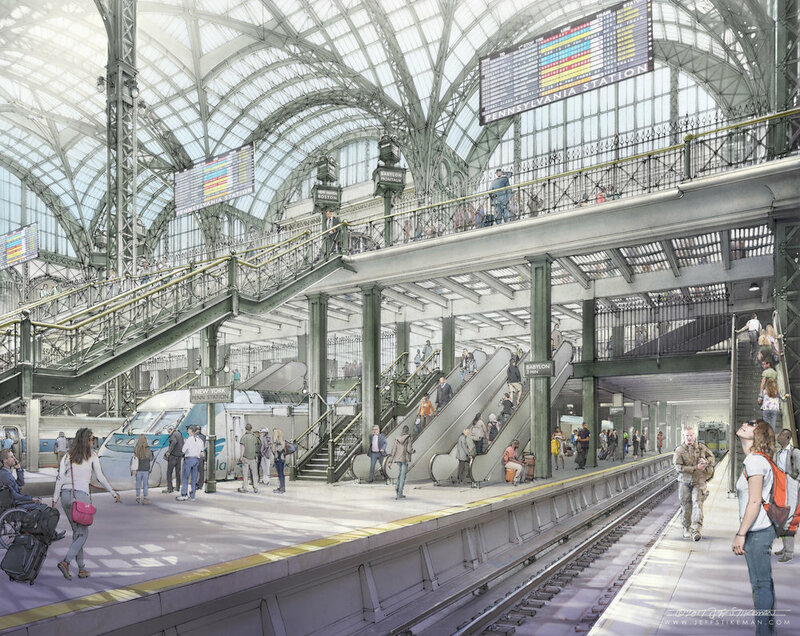 "The Grand Gateway in Waiting: Envisioning the New-Old Penn Station." Epoch Times. "New York’s Penn Station Needs a Resurrection, Not a Redecoration." Wall Street Journal. "Powerful New Backing for 'Rebuild Penn Station'." Traditional Building. "It's Time to Rebuild New York's Original Penn Station." Forbes.